Becoming a vegan can seem like a daunting task, and it’s not uncommon for those early in the switch to veganism to believe they’ll never enjoy their favorite foods again. Fortunately, that’s just not the case! Thanks to a wide variety of delicious vegan substitutes, you can enjoy all the comforts of the foods you crave, without losing the health benefits of a vegan diet. Keep reading, because we’ve rounded up some fantastic ingredients you’re sure to love. We have a feeling even your non-vegan friends will be fooled! So many cultures and outings are built around foods that involve meat: hamburgers, hotdogs, and tacos, for example! Some vegans simply don’t like the taste of meat and aren’t bothered by this change, but for others, the change is very difficult. Fortunately, we have some great options that will tempt even the most particular taste buds! Portobello mushrooms are one popular meat substitute. Thanks to their size and thick, almost meat-like texture, they are delicious and satisfying to chew. They are also easy and quick to grill up and are often used to make delicious tacos instead of fajita meat. Portobellos only setback? Low protein, so you’ll have to make sure you’re getting that elsewhere. Cauliflower is another vegetable that’s having its day in the sun as a vegan substitute. Dip it in breading and fry it up just like you would chicken for a delicious fried chicken alternative, or roast in the oven to make a cauliflower steak. Vegans tend to rely heavily on beans, and a popular choice for meat substitution are chickpeas, thanks to how protein rich they are. They’re also known as Garbanzo beans and can be coaxed into many different recipes to resemble tuna, burger patties, and a whole lot more! Of course, we can’t forget about tofu! If your nose turns up at the thought, you probably haven’t had it prepared well. Tofu can be delicious, and since it’s packed with protein, it’s incredibly satisfying and healthy without giving you that saturated fat meat hangover. Tofu can stand in for chicken or beef in stir-frys and takes on the flavors of whatever you’re cooking it with. Seitan is made from wheat gluten and while it tends to not be as versatile as tofu its texture is more like meat. TVP sounds (frankly) pretty awful (it’s defatted soy flour), but it’s full of fiber and thanks to its texture, replaces ground beef in things like chili easily. Finally, tempeh is made from whole soybeans using a traditional fermentation process that originated in Indonesia. It makes a great bacon substitute! You can purchase TVP, tempeh, and seitan on their own, but today’s pre-made meat substitution options are almost unlimited. You can find great brands creating excellent quality “bacon,” “sausage,” and almost anything else that might occur to you! Flax seeds and chia seeds bind with water to create a thick, gel-like consistency. This means that you can whip up “eggs” that mimic the original thing in baked goods thanks to their ability to bind ingredients ( just like eggs). These “eggs” are packed with Omega 3’s and fiber and are super healthy. They also have very little taste on their own. Today, you can even buy pre-made “eggs” at some stores! Unsweetened applesauce can take the place of oil or eggs in baked goods, and so can mashed bananas or avocados! The taste of avocados can be very strong, so be aware of that when you use it, but bananas and applesauce are so mild you’d never know they were in there. You can use approximately ¼ cup of applesauce of mashed fruit to substitute each egg. Ready for something weird and totally awesome? Aquafab is the liquid drained from a can of chickpeas. When whipped, it forms soft peaks, just like egg whites! It seems to be strange when you use it the first time, but once you fold it into a recipe, you’ll be a believer in this vegan substitute too! You can use it to make mayo, baked goods like donuts, cookies, and cake, and even waffles! 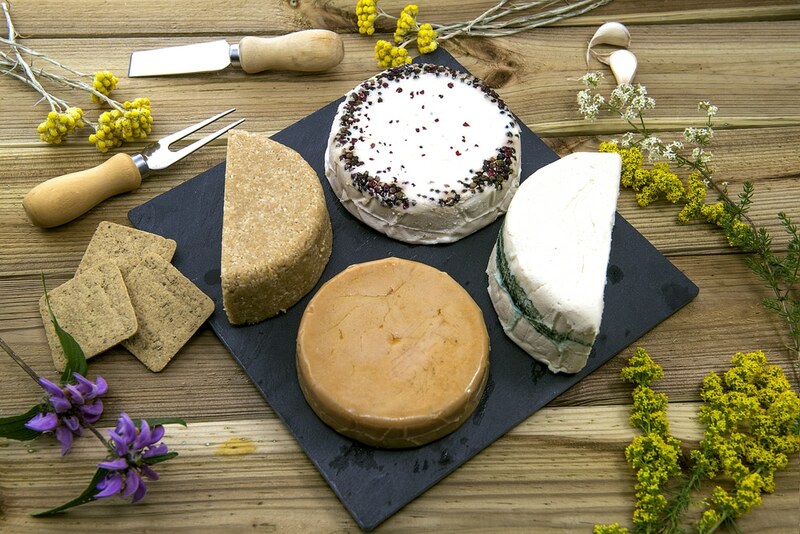 If you were vegan twenty years ago, your options for vegan substitutes when it came to nondairy cheese would have been sad. Thankfully, there’s a wide variety of substitutes now that are both delicious and have that great cheesy texture. You’ll never miss the real thing! Another weird-yet-wonderful ingredient from the world of vegan substitutes, nutritional yeast is grown from fungi. Think of it as a relative of the mushroom, but try it: it has a delicious nutty, cheesy flavor. Because it comes in flakes or a powder, it is often used to replace parmesan cheese. In general, however, it’s a popular option to replace cheese in things like vegan queso and vegan macaroni and cheese. Nutritional yeast is also packed with nutrients, particularly B vitamins. It’s gluten-free and also contains protein, folate, thiamine, and zinc. In short, it’s a superfood that makes a great addition to your pantry and condiment shelf. Because cashews are high in fat, when they’re soaked in water and blended they become very creamy. This, coupled with the fact that they have a mild, slightly sweet taste (just like cheese), makes them a great option for recipes that require that creaminess. They’re often used in combination with nutritional yeast and are full of protein, magnesium, and even iron! Daiya makes many delicious nondairy cheeses in a variety of forms, including shreds, slices, and melts, but it isn’t the only great brand on the market! Soy cheese has been developed to the point where it closely resembles actual cheese. Hungry for queso, nachos, or even fondue? Soy cheese has you covered! Coconut butter is not like coconut oil; instead, it includes the delicious nut’s fiber. The recipe is incredibly simple; just whiz shredded coconut flakes in a food processor or blender till a paste forms. This paste will be solid at room temperature, but once you spread it across your waffles or toast, it will melt nicely. And deliciously. Yep, there’s a soy product for that! Unlike coconut butter (which has a strong coconut taste), soy margarine tastes much more like butter (and it’s so much healthier). You can use it in recipes just like you would butter. Super popular since the 80’s, soy milk is usually fortified with more calcium than even cow’s milk. Those people who say vegans can’t get enough calcium are plain ‘ol wrong! A favorite because of how easy it is to make at home (and for it’s light, nutty taste), almond milk is almost universally available and filled with healthy fats. You can typically find it in sweetened or unsweetened options. One of the fun things about becoming a vegan is trying different products and flavors to find new favorites. Rice milk, hemp milk, and oat milk each have delicious tastes and are fun ways to experiment. Hemp milk, in particular, is packed with fantastic vitamins and minerals–including omega 3’s. Is your mouth watering yet? What a delicious list of great vegan substitutes. Now, your only problem is which one to try first!